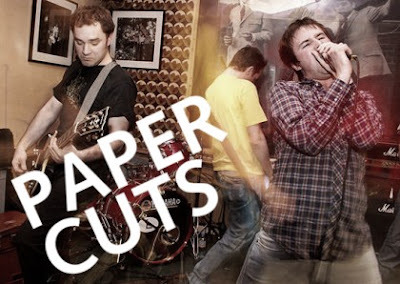 I listen to this West Londoners group, Paper Cuts, and can hear nothing but Mark E. Smith poking his head out of their dense, ragged, terribly abrasive post-punk style. Which is really a little unfair on my part ... although these do hold a lot in common with the Fall and Mark E. Smith (especially vocally), there's a lot more going on beneath the surface. First and foremost, I hear a little bit of like ... the Offspring or Social Distortion or something. There's an element of that no-nonsense Southern California punk mixed into Paper Cuts' music that sets them apart from groups you'd innately identify them with, and I think that's pretty damn cool. Check out "82 Doo Doo Doo" and "Exit This Topic" below. They rock hard. This has made my weekend !!! Thanks Nik, you the mam !!!!! !